This new Readers Circle edition includes a reading group guide and a conversation between Firoozeh Dumas and Khaled Hosseini, author of The Kite Runner.” In 1972, when she was seven, Firoozeh Dumas and her family moved from Iran to Southern California, arriving with no firsthand knowledge of this country beyond her father’s glowing memories of his graduate school years here. More family soon followed, and the clan has been here ever since. 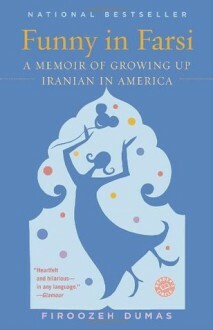 Funny in Farsi chronicles the American journey of Dumas’s wonderfully engaging family: her engineer father, a sweetly quixotic dreamer who first sought riches on Bowling for Dollars and in Las Vegas, and later lost his job during the Iranian revolution; her elegant mother, who never fully mastered English (nor cared to); her uncle, who combated the effects of American fast food with an army of miraculous American weight-loss gadgets; and Firoozeh herself, who as a girl changed her name to Julie, and who encountered a second wave of culture shock when she met and married a Frenchman, becoming part of a one-couple melting pot. In a series of deftly drawn scenes, we watch the family grapple with American English (hot dogs and hush puppies?—a complete mystery), American traditions (Thanksgiving turkey?—an even greater mystery, since it tastes like nothing), and American culture (Firoozeh’s parents laugh uproariously at Bob Hope on television, although they don’t get the jokes even when she translates them into Farsi).Above all, this is an unforgettable story of identity, discovery, and the power of family love. It is a book that will leave us all laughing—without an accent. I like memoirs from people who came from the Middle East. While Iran is not exactly the Middle East, I'll give it to her. This is a laugh aloud funny book. Her family is truly funny. Thank goodness I never had an experience at sleep away camp like she did. This would make a good book club read.